Closely related to the discipline of solitude that we talked about yesterday is a practice that is so linked to solitude that it's not usually listed as a separate discipline. Yet it's one of utmost importance, so I'm dedicating a post to it. Oh, mercy. I was on a retreat once and our group's director decided that we would all observe three hours of silence one morning. Now, some folks had signed up for a "silent track" at this retreat; they wanted to be silent. Kind of like monks, you know. Guess who had not signed up for a silent retreat? Guess who struggled the most with those three hours? I love to talk. That's one of the reasons I like blogging so much--it's like talking to people all over the world. And I love to listen to people talk. People are so interesting! I love to hear their stories and learn all about them. It's fascinating! But with all the talking and all the listening and all the general noise in my life, guess whose voice I have trouble hearing sometimes? Yes, indeed. That would be God's. Richard Foster writes, "Jesus Christ is alive and here to teach his people himself. His voice is not hard to hear; his vocabulary is not difficult to understand. But learning to listen well and to hear correctly is no small task" (Sanctuary of the Soul, p. 9). Why do we not hear God's voice more clearly? I think it's mostly because we're not usually listening. We're talking. We're filling all available space with our own needs and desires and interests. We're busy, for crying out loud. And the result is that we don't give God a chance to get a word in edgewise. I think perhaps we keep up a steady stream of noise because we have some ideas about God that are not true. We're afraid to listen for his voice, because we don't trust that what he has to say will be good for us. One of the great benefits of practicing silence and listening for God's voice is that, when we hear it, we'll be amazed at the goodness in it. Richard Foster also writes, "The quality of God's voice is one of drawing and encouraging. The spirit in God's voice is all grace and mercy. And the content of what is being said is always consistent with what God has said before--we have a huge biblical witness upon which to test our leadings" (Sanctuary of the Soul, p. 11). More than anything else, practicing silence has demonstrated to me that God is completely trustworthy. His voice, whether speaking through the written word of the Bible, the spoken word of a good teacher, or directly to my heart, is always one of goodness. Furthermore, keeping silence has sometimes deprived me of being able to speak up for myself. I tend to jump at the chance to defend and justify myself. When I practice silence, I have to trust God to protect me--and I learn that he is trustworthy in this way, too. Solitude and silence--what do you think of them? Do you practice them? If so, have these practices helped you? Please share! 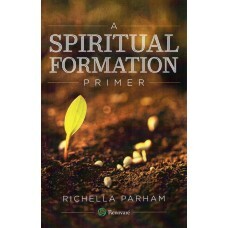 This post is part of a 31-day series on spiritual formation. To see all posts in this series, click here. Or click here to see all the bloggers participating in the 31-day challenge! It's hard for me to quiet my mind too. But in those moments when I truly let go, my mind is open to the Holy Spirit and I feel free. Oh, dear Richella, to have silence and solitude! Actually, when you mentioned solitude yesterday, I was wondering if you'd ever read or prayed the "Desiderata" by Max Ehrmann. It starts, "Go placidly amid the noise and the haste and remember what peace there may be in silence." I read this every day and it is a reminder of how I need to stop, turn off all modern day toys, and just "be" in the silence and solitude. It is then when the Father often will whisper His wisdom to me.